When we reflect on the grace that God has given us, we are called to respond in many different ways. Often this can come in terms of treasure, time, and talents. At University Presbyterian Church, there are many wonderful ways to share the grace we have all received. New! As the spirit moves you, add to our General Fund or our Building Fund easily with your credit card. In grateful response for all that we have received, we are called to share our financial resources. With the information below, you may find many ways to express your gratitude through the ministries of University Presbyterian Church. Each year, UPC enters a season of Stewardship. Now a permanent committee of the Session, the Stewardship Committee works diligently to provide meaningful ways to engage with the process, including gatherings, announcements, brochures, videos, and even this site. As we walk together through this season, may we all be attentive to God’s call. University Presbyterian Church consolidates all operating expenses into its annual budget. We don’t do special fundraisers or receive special offerings to supplement the ongoing work of the church. However, we do receive four special offerings each year in behalf of the Presbyterian Church (USA), plus the Christmas Eve Offering. One Great Hour of Sharing – Received each Easter, gifts to the One Great Hour of Sharing offering enable the church to share God’s love with our neighbors-in-need around the world by providing relief to those affected by natural disasters (through Presbyterian Disaster Assistance), provide food to the hungry (via the Presbyterian Hunger Program), and helping to empower the poor and oppressed (by the Self-Development of People program). Pentecost Offering – This offering, received on Pentecost Sunday, helps the church encourage, develop, and support its young people through the Young Adult Volunteers program, and also address the needs of at-risk children. UPC retains 40 percent of the offering to support similar programs in our community. Peace and Global Witness Offering – We receive this offering on World Communion Sunday, the first Sunday of each October. This offering supports the global peacemaking initiatives of the Presbyterian Church (USA), though 25 percent of gifts received remain with us to use to support local peacemaking initiatives. Christmas Joy Offering – Received during Advent each year, the offering helps provide financial assistance to current and former church workers and their families and also enables deserving students to attend Presbyterian-related racial ethnic colleges and schools. Christmas Eve Offering – The offerings received each Christmas Eve are used to support local outreach ministries supported by the Session. In recent years, the offering proceeds have been divided between the Pastors’ Discretionary Fund (for offering crisis assistance to individuals and families in need) and the Martin Luther King, Jr. University/Community Foundation scholarship program for area youth. How do we go and make disciples? We do this in the here and now through our giving and our living. But what about planning for the future? For many of us, planning for the future includes financial and estate planning. Just as your faith is a part of your financial decisions for today, so should it be a part of your financial decisions for tomorrow. Planned giving is an opportunity for us all to return to God that which God entrusted us with during our lifetime. It is also an opportunity for us all to further strengthen Christ’s church for the future by providing for ministry and mission for those who come after us. We all stand on the shoulders of those who came before us; let’s be the shoulders for those who come after us. If you would like to know more about any of these types of giving or would like to let University Presbyterian Church know about plans you have made, please be in touch with Katharine Yager for more information. UPC can accept donations in the form of shares of stock. The process is simple, and involves simply informing the two parties below about your gift. Desired application of gift – Current Annual Pledge, Upcoming Annual Pledge, Legacy Fund, etc. As people of God, we are called to use our time to build up the body of Christ in the church and the world. Orienting our schedules in response to God’s call requires practice, commitment, reflection, prayer, and discernment. Outreach is the way we are Christ’s hands and feet in the local community and the wider world. You can find a wealth of ways to make a difference on our Outreach pages. We’re Presbyterian – of course there are committees! Committees run the church, and they need all of us to help. There are many ways to serve; use this list as a starting point to discern the way God is calling you in this season. UPC church office volunteers have the opportunity to serve the church while getting to know the administrative staff. The office relies on volunteers to assist us in welcoming visitors, answering the phone and simple clerical tasks. Our volunteers come in for a morning or afternoon shift and may help us out once a month, every other week or once a week. Substitute volunteers help us fill additional monthly shifts or as an occasional replacement for regular volunteers. All of our regular shifts are currently filled by church members. If you’re interested in volunteering as a substitute or if you have questions about volunteering in the church office, please contact Shelley Adams at shelleyhadams@gmail.com. We appreciate all our volunteers and are very thankful for their service! At University Presbyterian Church, we work together to glorify and embody the Living Christ. We encourage you to ask yourself, “How am I a part of this Body? What passions, interests or gifts do I have to share?” To help us ensure that you’re active in the places where God is calling you, we invite you to share your Time and Talents on your Access ACS profile. Even if you’re not available to help right now, we’d still like you to share what areas of the church you’d like to serve in the future. Thank you! Just as the Apostle Paul encouraged the church in Ephesus to live according to their call, we at University Presbyterian Church are encouraged to share our gifts and talents. Our church depends on the multitude of gifts of the congregation in order to witness to the love and call of Jesus Christ. 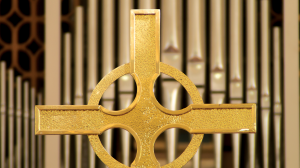 Music, one of the most ancient and powerful of liturgical arts, is a holy gift of God. Here at University Church, we endeavor to honor the ‘first art’ – that of singing – to glorify God. Thus, our choirs take their place as contemporary stewards of the centuries-long tradition of enhancing and adorning worship through fine choral music. Their music, their effort, is, in essence, their gift back to God. We are grateful for the privilege and responsibility of living out the vows we make at Baptism, as we nurture the faith of the children, youth, and adults at UPC. Contact Nancy or Kate if you are interested in sharing your talents by teaching and encouraging our church family on the journey of faith through Sunday school, Godly Play, retreats, and other educational programs. The congregation annually elects elders and deacons to lead and serve the congregation. Elders serve on the Session for three-year terms, overseeing the administrative and program ministries of the church, developing and maintaining an annual budget, and supporting the worship, music, education, fellowship and outreach ministries of the congregation. Deacons are similarly elected for three-year terms to offer ministries of care, compassion and support for the congregation through a variety of programmatic initiatives and by personal contact with members of the congregation.